Are you ready for exhilarating speed, invigorating competition and skating so sharp-edged you can feel the ice spraying in your face? Then prepare yourself for Youngblood! 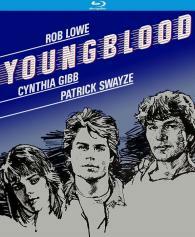 Showcasing the talents of Rob Lowe (The Hotel New Hampshire, St. Elmo's Fire) and Patrick Swayze (Point Break, Ghost), Youngblood is fist-flying, stick-smashing, body-checking thrills right up to the final buzzer. Teenager Dean Youngblood (Lowe) has out-skated just about everybody since he was six. Now he's set his sights toward National Hockey League fame with the ragtag Hamilton Mustangs, an amateur Canadian team just across the border from his family's farm. Certain that his swift moves on the ice will dazzle the crowds, Dean quickly learns that his speed and finesse won't pack enough punch against the bad boys of the league, the Thunder Bay Bombers. And when the Mustangs' top scorer (Swayze) gets knocked out, Dean has to turn from a rookie to an all-star fast. Directed by Peter Markle (Bat 21) and featuring Cynthia Gibb (Modern Girls), Ed Lauter (Breakheart Pass), Jim Youngs (The Wanderers) and Keanu Reeves (River's Edge).